In this video course you will discover how to generate everlasting income online using mind blowing simple methods that require little effort and investment. These are the same tactics used by an elite few to bring in a storm of massive continuity income. 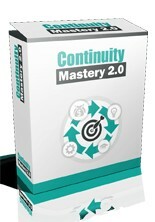 Alos look for ‘Continuity Mastery 2.0 Advanced‘ for more videos that will expand your training. [NO] Can resell with Private Label Rights.